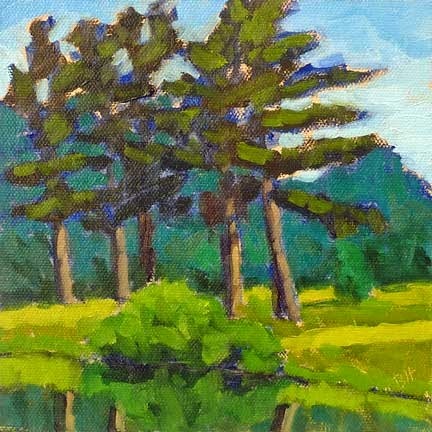 "Farm Pond Pines in Winter"
Practice making art every day. It can be hard to do this, with the other commitments we all have, but the feeling of satisfaction from doing it is powerful. More sketching and iPad painting when it's too hard to get out the gear is my plan. And, I'm going to try to make art every day in January. Learn to paint better. For me, painting small paintings regularly really helps. And I love taking workshops! Explore more mediums and techniques. 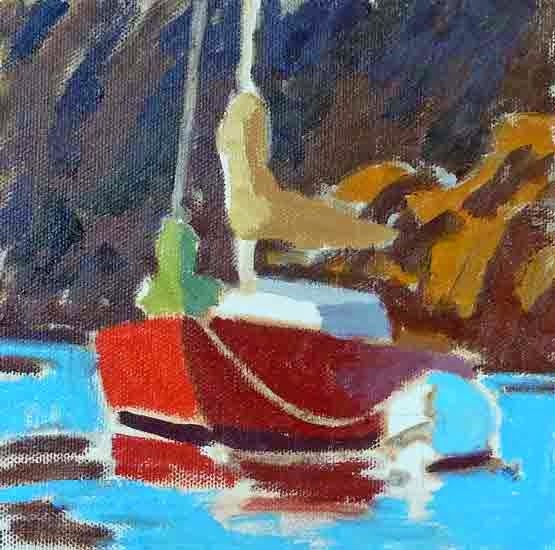 So far I'm signed up for a knife painting workshop with Leslie Saeta in March, and a pastel workshop with Tony Allain in June. More to come. Share art with others. It's a lot of work to blog and share on Facebook, in 2015 I want to better differentiate my content. Help others to enjoy art. I've found out in 2014 that I love teaching painting! Thanks to my students for making that so. I'd like to do more of it in 2015. 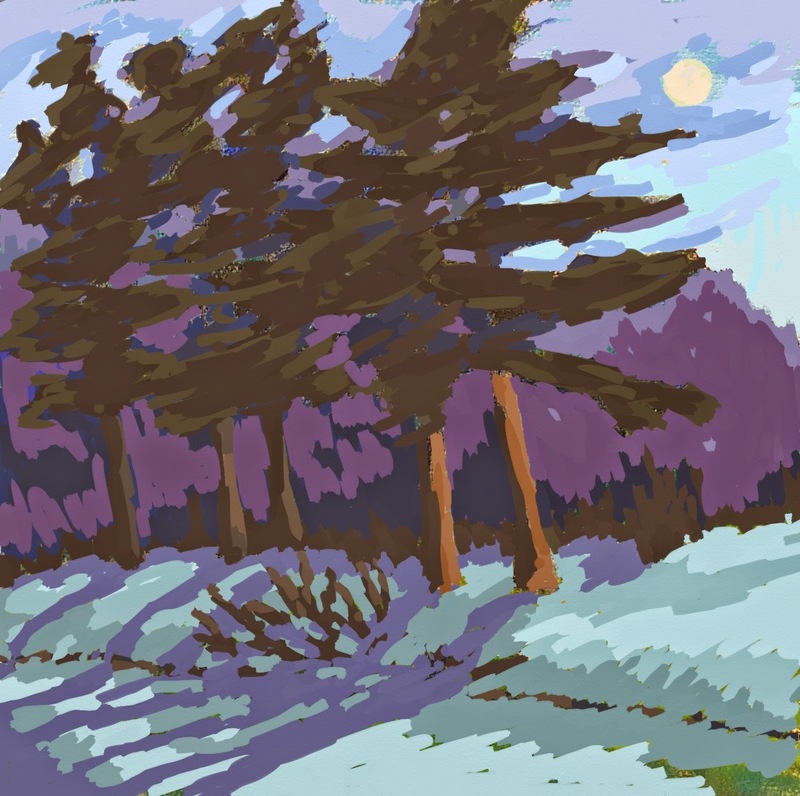 Today's painting was painted in ArtRage over a photo of a plein air painting I did four years ago. I've tried this before, with a painting done at the same location. I hope you like it because I'm going to experiment along this line for a bit. Here's the painting underneath. 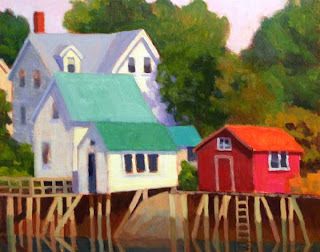 I'm teaching a class at Artascope in Yarmouth, Maine, on creating your own style with color. Monday is our last of 6 sessions and we've had a lot of fun. The students have been great, and eager to try new things. We've done toned canvases, bold color under paintings, and studied drawing, values, and mixing clear bright colors. 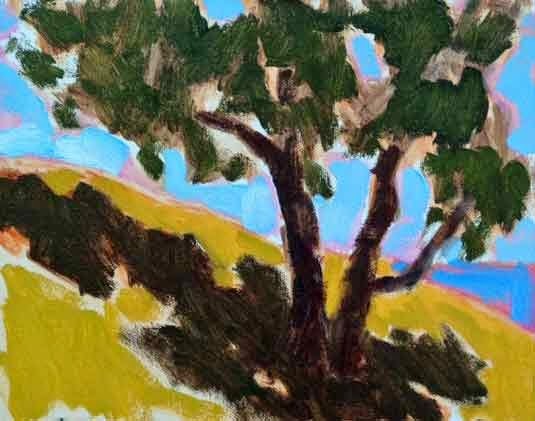 This is my demo from class 4, where I went a bit wilder than everyone else, with a Fauvist rendition of a painting from my past. We also had some fun doing value paintings over photographs. Below are some of the student paintings. Everyone really enjoyed this one. Saturday night we're having the opening for the Holiday Show at Yarmouth Frame and Gallery. It's from 4-7PM and is always fun. These are my paintings in the show, and there are many more from 37 other artists! Please join us. 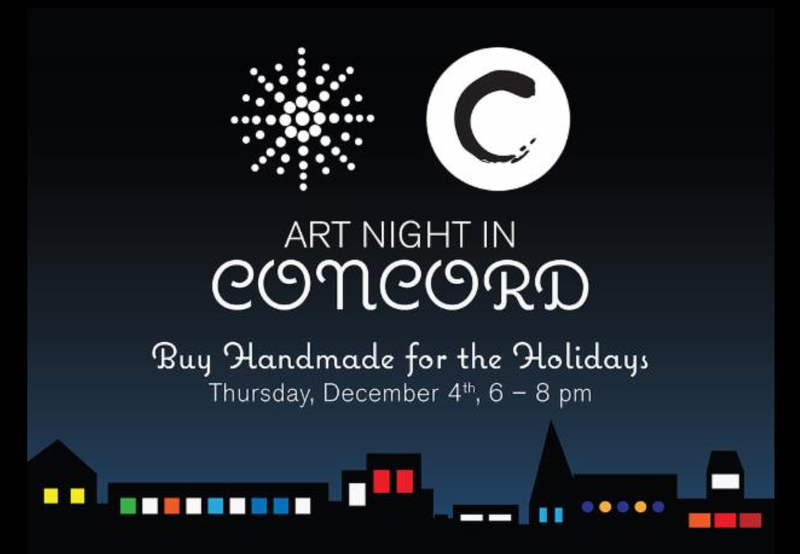 Please join me for Art Night Concord, in Concord, MA this Thursday. I'll be at the Concord Art Association from 6-8PM, talking with other members and those who have art on their Christmas shopping lists. There will be paintings, jewelry, beautiful cards, ornaments and other holiday offerings. It will be great fun! And just a reminder that my Cyber Monday sale goes through midnight, 1/3 off selected paintings and free shipping! Click here to shop the sale. 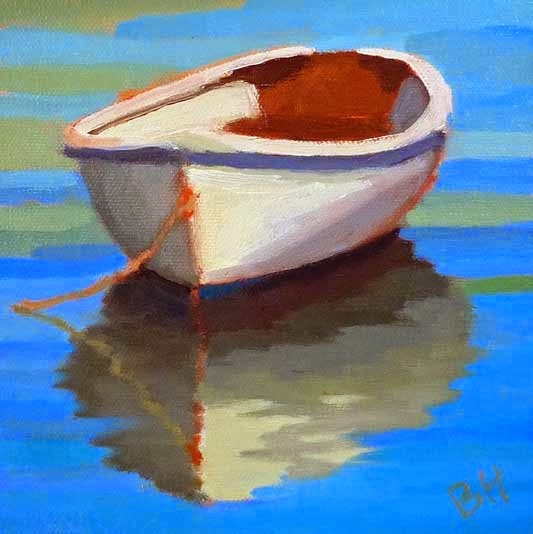 Bobbi Heath Fine Art is having a Cyber Monday sale! 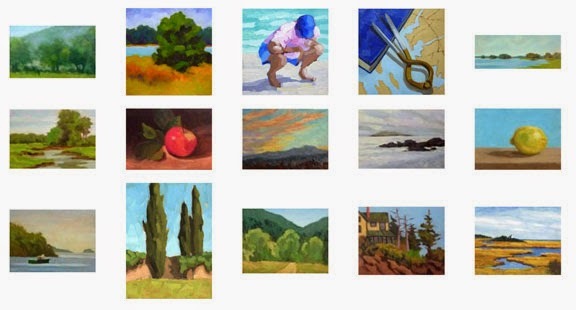 I've selected 15 paintings and taken 1/3 off each one. 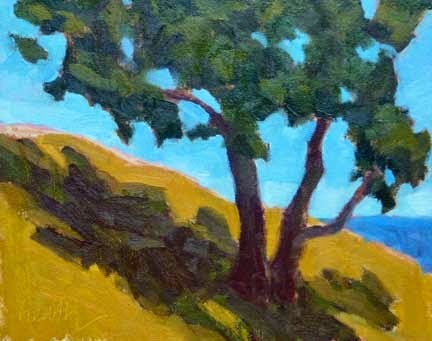 If you'd like to add to your art collection, or you have a special gift to select, this sale could be a great opportunity. You can view the paintings now, and the shopping cart will be available Sunday night at 10PM through Monday night at midnight. 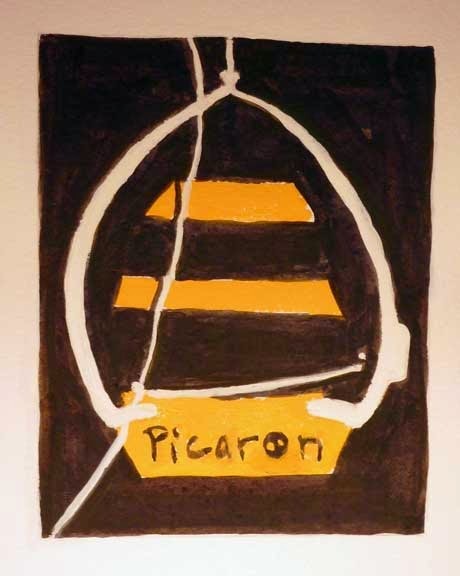 Click on the image grouping above to view the paintings. If you'd like a reminder on Sunday night, just leave a comment or reply to this email. 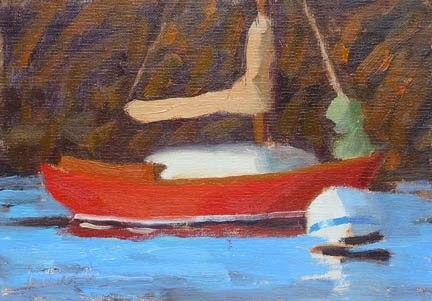 This weekend I finished a painting that I started en plein air in September. 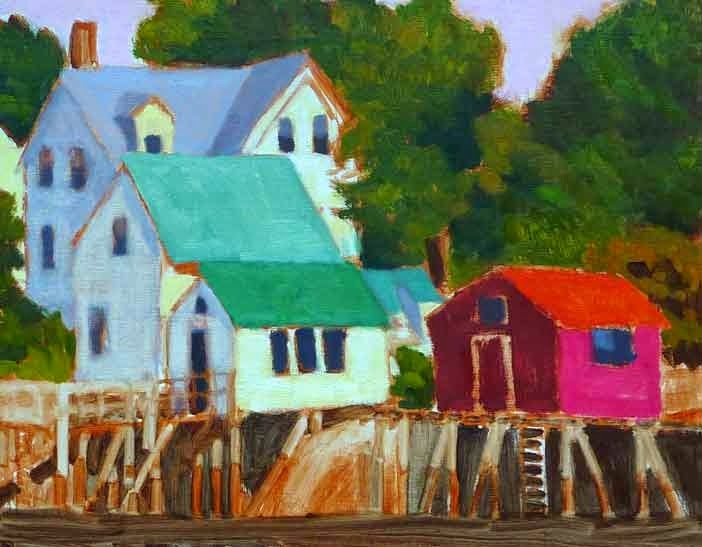 When the Plein Air Painters of the Southeast visited, after one of our morning painting sessions and a great lunch at Oliver's in Cozy Harbor, Ann Self offered to show me another part of the village. And guess who were already there? Colin Page, Anne Blair Brown, and Andre Lucero! A couple of weeks later the sun and the tide converged and I was back. 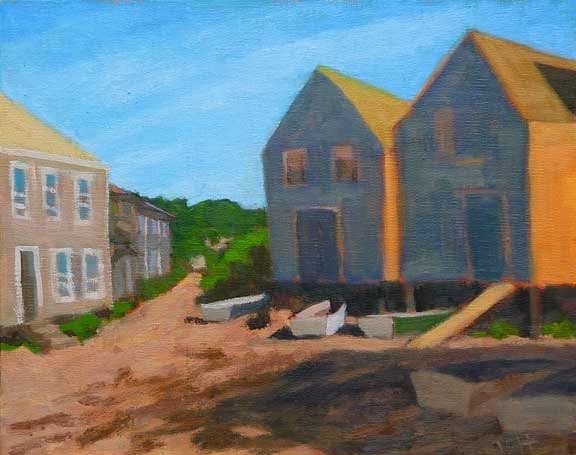 After two plein air sessions, I learned I'd been parking in someone's driveway, oops. 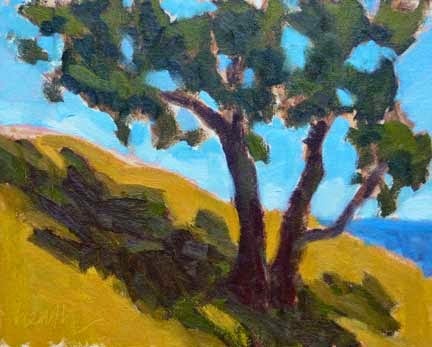 And thus, the plein air painting was completed in the studio. 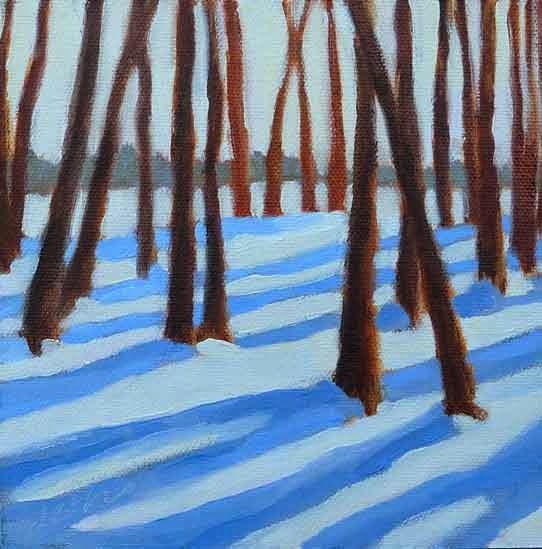 This is another painting for one of my gallery holiday shows. Both galleries asked for paintings to view so that they can make a selection and gave me their preferences for subject matter. I appreciate their feedback and will post their choices as soon as the choosing is over. 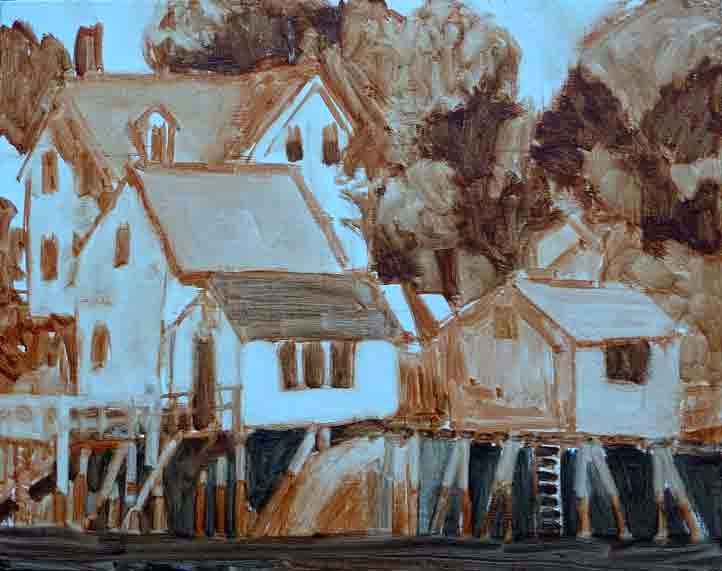 A big thanks to Mary Tetro for the photo I painted this from, a lovely New England harbor. I'm on Cape Cod, and it's snowing! Just kidding. I started this one last week, and wanted to finish it for the up coming holiday season. 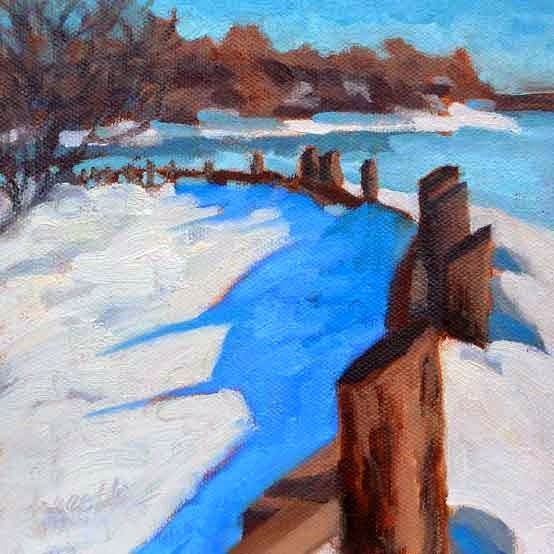 I've painted it before, and always love this winter scene at Thomas Point in Maine. This is my final painting for Leslie Saeta's 30 Paintings in 30 Days Challenge. I've painted 30 and shown you 28 of them (2 failed quality assurance!). I want to thank you all for your patience and perseverance, and for all the wonderful comments. I do have a question, for a potential next time. Were there too many posts? 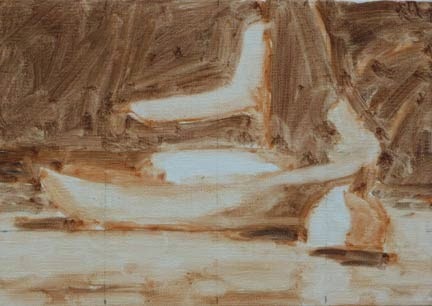 Would fewer posts per week with more than one painting in each make for better viewing? Thanks so much for your help. 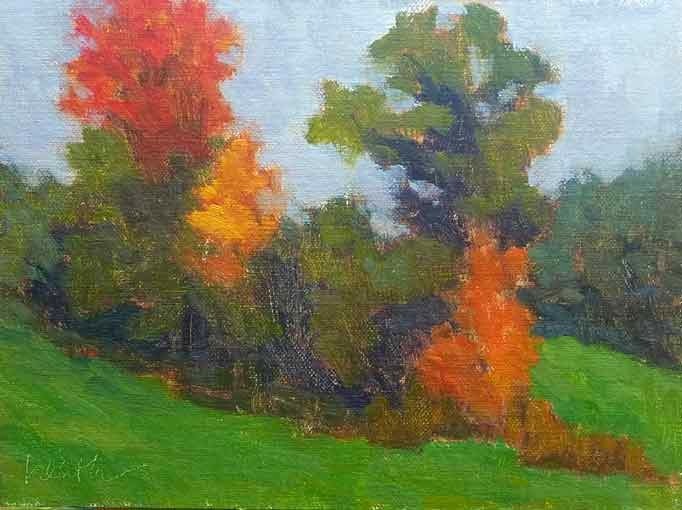 The 6"x6" and 5"x7" paintings done in September will be priced at $100 through October 1st, and on the 2nd, will go up to the normal $150 price. 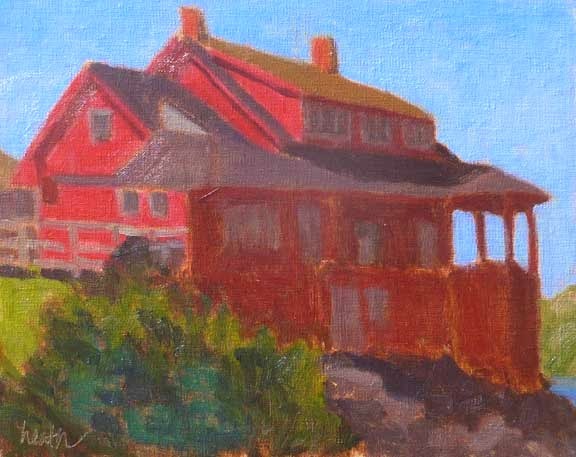 Today I painted with the Plein Air Painters of Maine on the grounds of Hamilton House in South Berwick, ME. As the afternoon worse on it got colder and more overcast, but we could still see the rich fall colors. 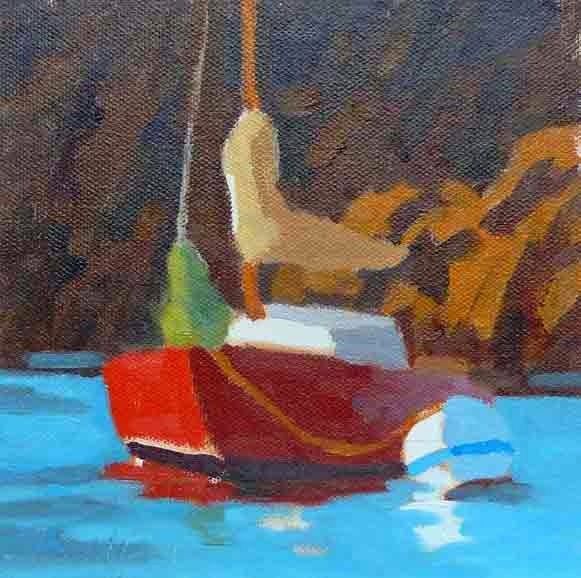 I've painted this beautiful classic dinghy before. It belongs to a local lobsterman. I got back to Cozy Harbor on Wednesday. It was tough trying to decide exactly how much light to have on the fronts of the white buildings. I think I like the two on the right best. Still some work to do, but it will have to be from home. The place I was parking turns out to be someone's driveway. 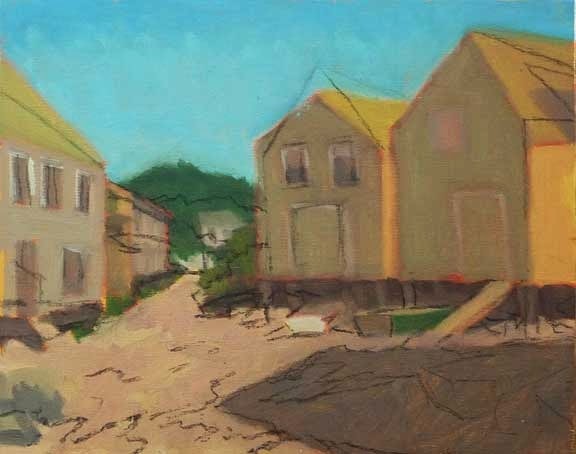 I worked again today on this painting of Fish Beach on Monhegan. The bottom image shows the painting at the end of a couple of hours on site and some edits in charcoal. What do you think about the revised version (image at top)? Which version do you like better? 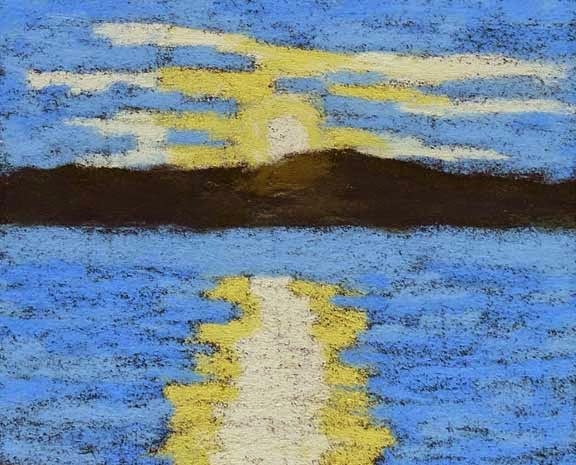 My first effort at a plein air pastel sunset. 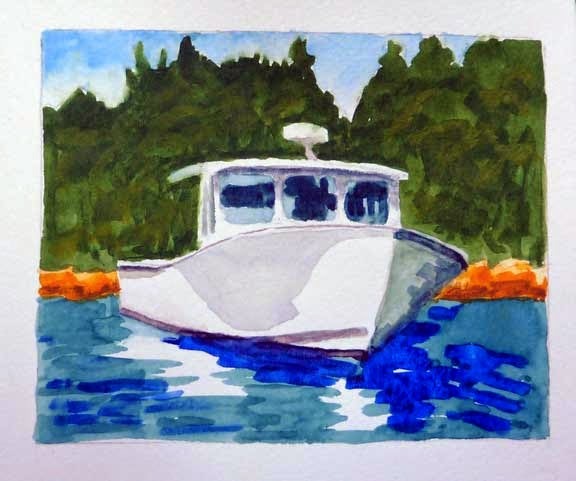 While the Plein Air Painters of the Southeast were visiting Maine a couple of weeks ago, I learned about a beautiful spot on Southport Island where I hadn't painted before. I went back today and did a value underpainting, which hopefully I can complete tomorrow. 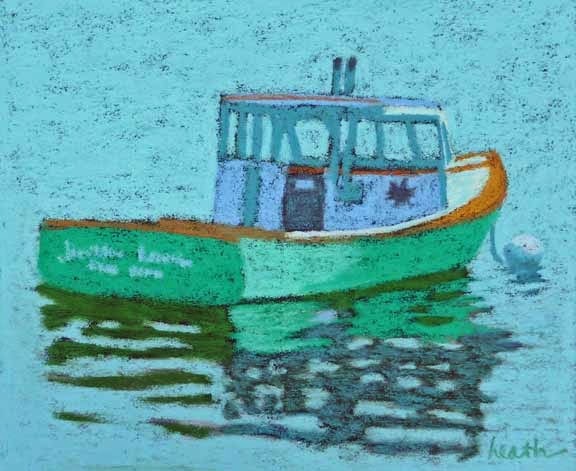 The Janette Lamson lives in Camden, Maine. We were moored near her on our recent trip. It was very foggy when I took the photo for this painting. A little sketch for a future woodcut. This dinghy lives in Rockport, Maine. The double o in the name was actually the two eyes of a skull and cross bones, but I couldn't make that work. I'll post a better picture tomorrow, when I can take one in natural light. The Martha-Gayle is a lobster boat from Port Clyde, Maine, which we saw on our recent boat trip. 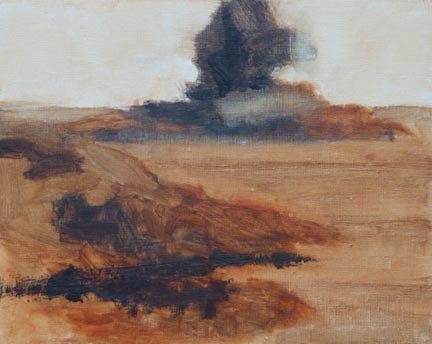 Painted using the Jo MacKenzie approach. 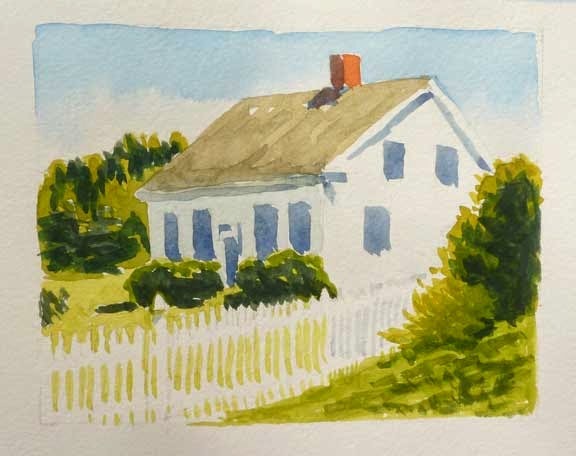 Just a quick small watercolor of the white house on the east side of Main Street on Monhegan. This is my 501st post. Thank you all for your support over the last five plus years! 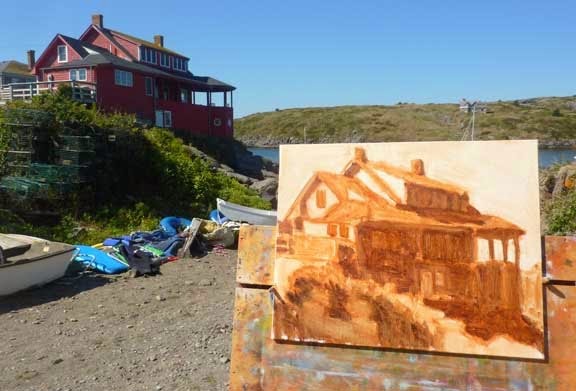 Today, our last day on Monhegan, I tackled the famous Red House. I used ValueViewer on the levels setting to show me the scene in 3 values with a 4x4 grid. I don't measure the grid on the panel, but just estimate it by dividing each side of the panel in two, and then in two again. I used the grid to place the most important corners, then estimated the rest of the drawing from that. The value block in came next, and then the color on top of that. I can see posting this that I was chasing the light at the end. I might use the photo of the value painting and the Value View to fix things a bit, but I was happy with what I did. Especially after yesterday afternoon, when I had trouble on Fish Beach. 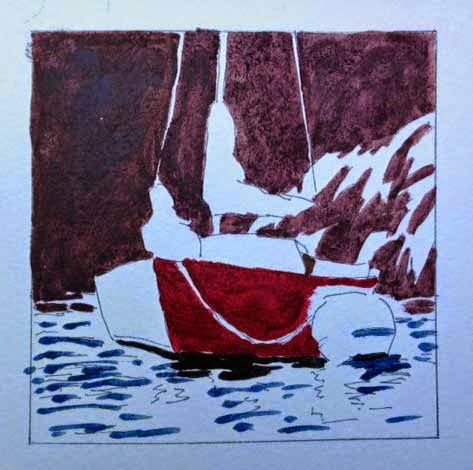 But not as much trouble as the lobsterman who had beached his boat and was then worried about it tipping over as the tide came back in. 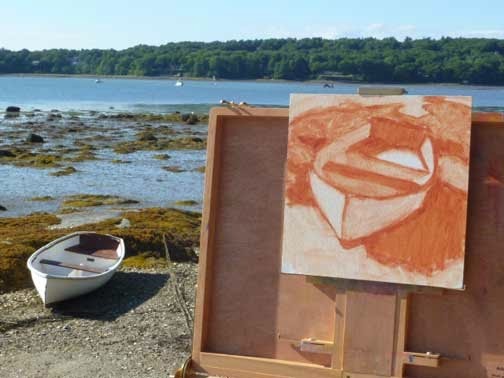 You can learn a lot plein air painting! I'm on Monhegan with Mary Sheehan Winn, such fun! Yesterday was gray and sprinkling when we arrived and I didn't post my lackluster effort, but today was bright, sunny, and warm. I stood near the dock for three ferry arrivals and captured the trucks as they came and went. 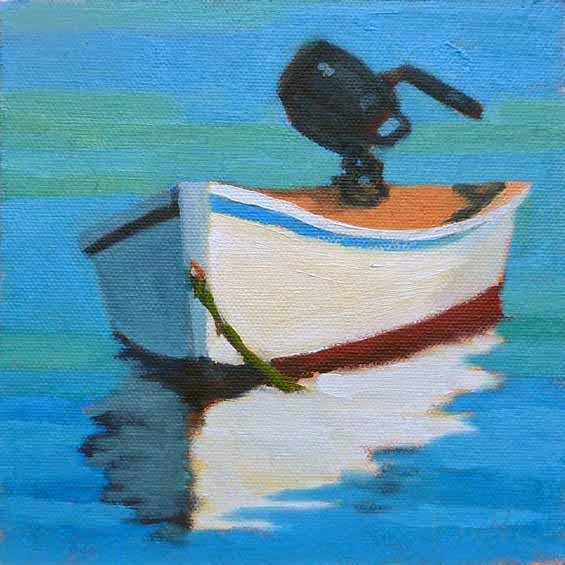 One of the fun things about Leslie Saeta's 30 paintings in 30 days challenge, is checking out the other paintings and painters. I've really enjoyed the watercolors by Jo MacKenzie, and reading about her process, which is to paint dark to light, the way we do in oil painting. So I bought her book, and above is my first attempt at using her process. I like it! 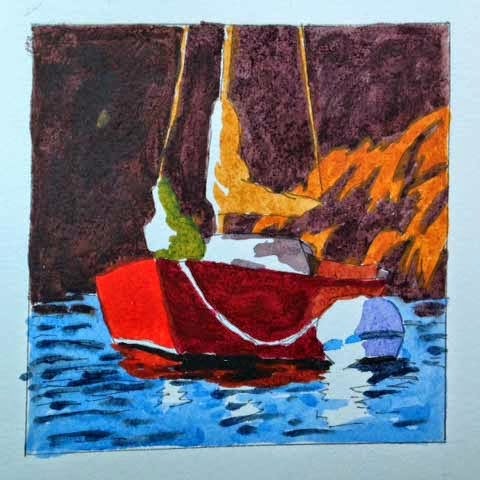 I wasn't totally satisfied with the first Red Sailboat Boothbay, and so went back to my Anne Blair Brown notes. Anne had told us to "think like turtle, paint like rabbit". I decided to think more about this one, and to let each brush stroke lay, rather than to paint over it. I forgot to take a photo of the value study underneath, but here's one of the painting after the color block-in. 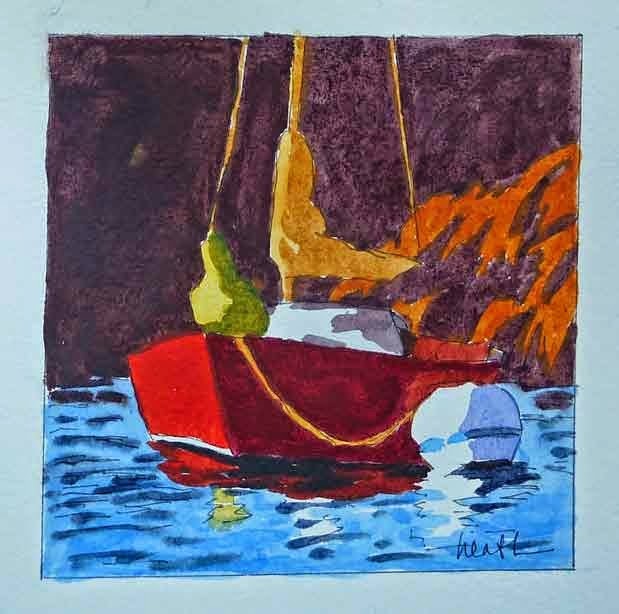 This is the red sailboat in Boothbay that I had so much fun drawing when we visited on our boat. I did the value sketch yesterday and added the color today. 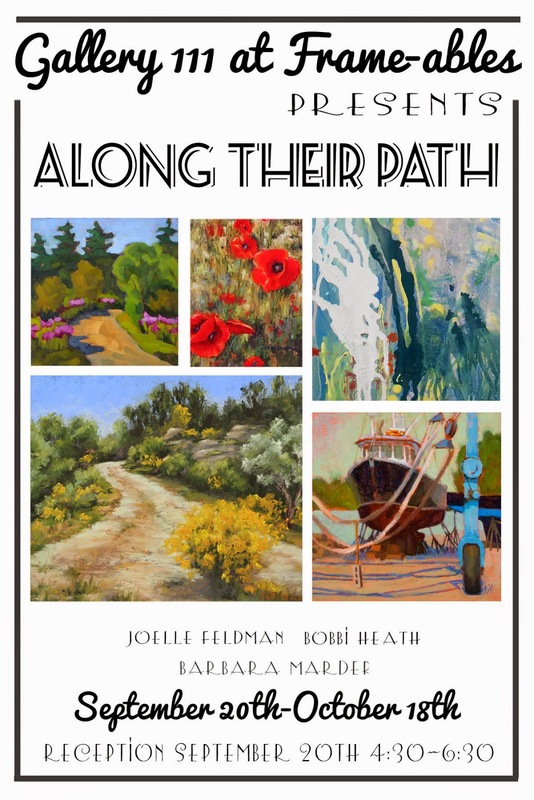 I wanted to let you know that I have a show opening next Saturday, Sept. 20, at Gallery111, at 111 Thoreau St., in Concord, MA. I'd be very pleased if you can join us. Your invite is below. 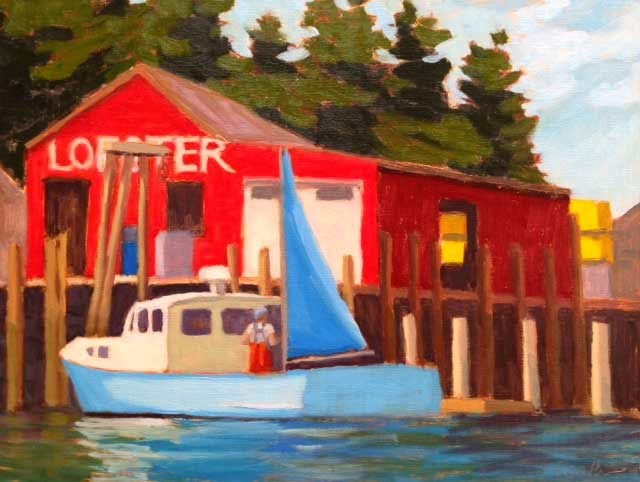 This last week the Plein Air Painters of Maine have been hosting the Plein Air Painters of the Southeast in Boothbay. Lots of paintings were created, and it was great fun. 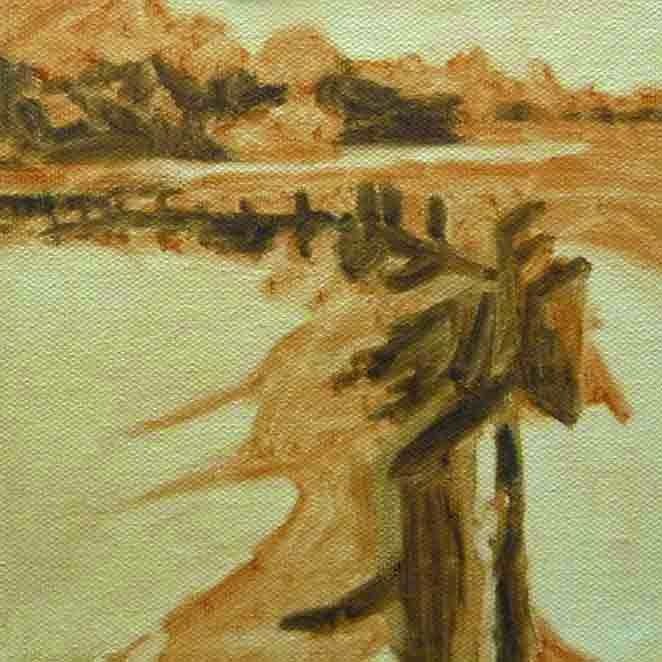 I painted three of the days, this painting is from Hendricks Head on Southport Island. 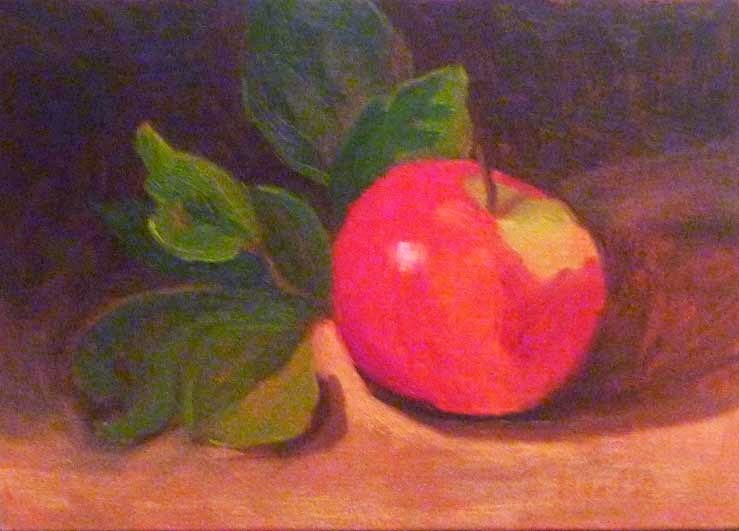 Visit Pamela B Padgett Studio on Facebook to see PAPSE member, Pam Padgett's, version. 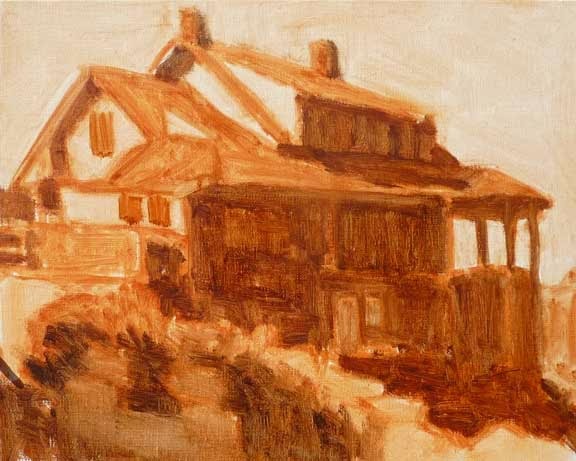 In Anne Blair Brown's class last week our first exercise was a plein air burnt sienna block in, which Anne adjusted for each student. 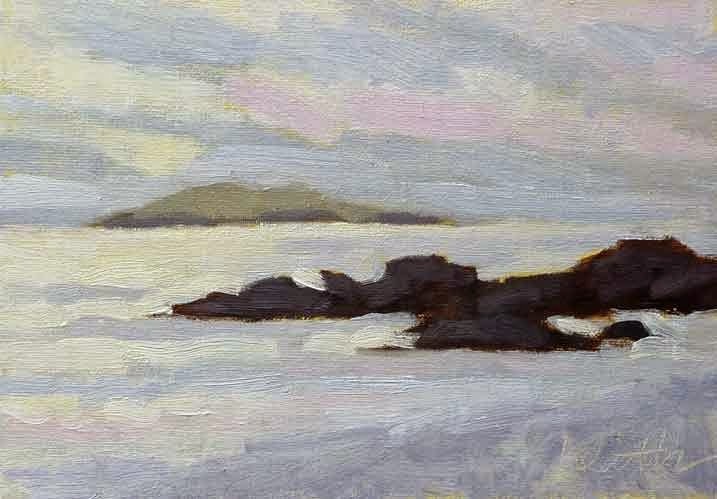 On mine she added the dark sideways "V" in the left foreground to balance the island in the upper right. 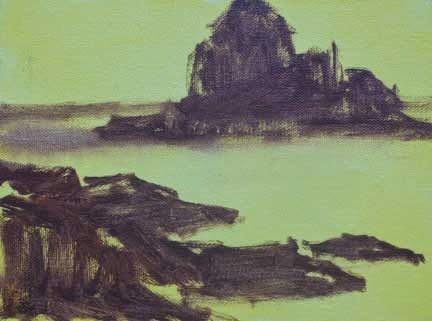 Yesterday I did a quick block in of the same subject over yellow, thinking that would work nicely with the fog that had been descending since morning, but I'd hardly gotten started when the fog completely obscured the island! 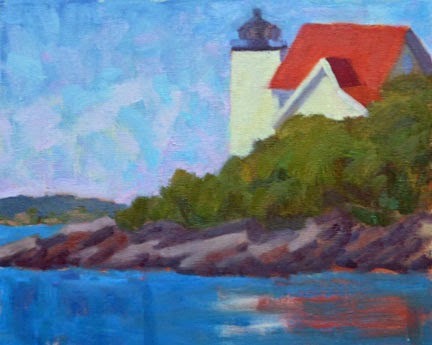 "Cloudy Day at Ocean Point"
Today the Plein Air Painters of Maine had our OPA Paint Out at Ocean Park in East Boothbay. It was fun even though the overcast morning sky gave way to fog in the afternoon. 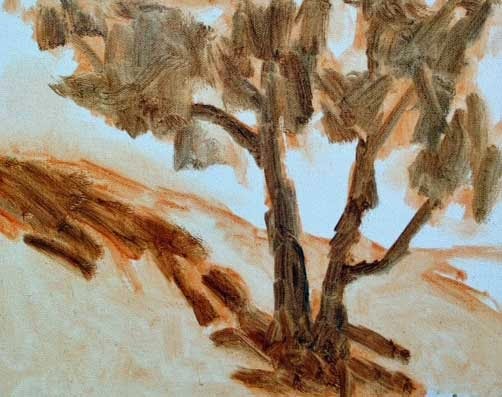 Today I worked on a tree study using the method we learned last week from Anne Blair Brown. I am missing the initial step in these posts, which is a set of four small value studies in my sketchbook in pen or marker. I did them, but just keep forgetting to take a photo. 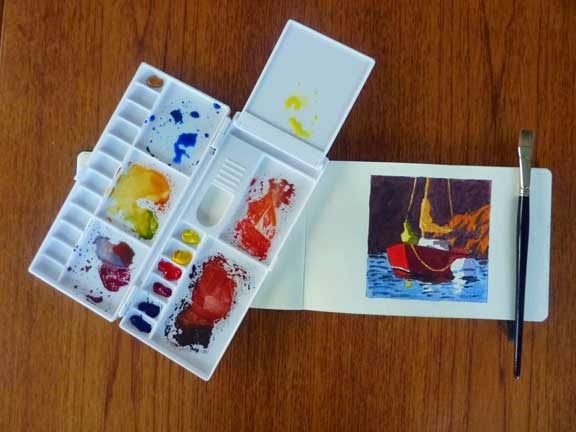 I got a question on yesterday's post on this approach, which was "how do you keep from picking up the underlying burnt sienna?" There are several factors involved: using enough paint, lightness of touch in going over the value study, and consistency of the paint. Initially I thought it was all about the consistency of the second layer, but I now think that the first two are more important. Anne had us mix pools of paint for the color block in, with an emphasis on making big pools. 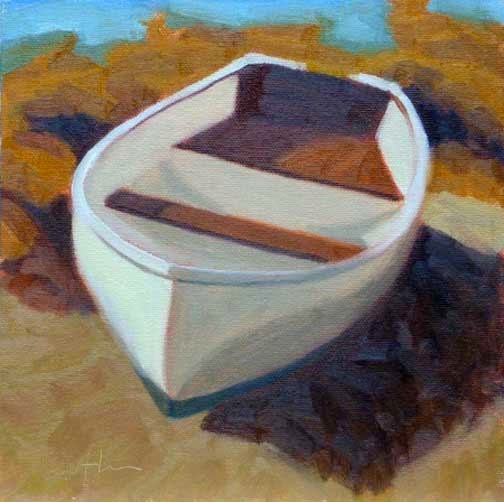 Try this: Paint a stripe of dark burnt sienna (add a little ultramarine blue to darken it), and then with a good bit of paint and a light touch, paint a stripe over it of another color. Try medium or gamsol to vary the consistency of the upper layer, and I think you'll find a way to make this work. This week I've been taking a walk to our family cottage in the afternoons to see where the tide has deposited each of the rowboats. Every day it's different. Today, Churchy was in a nice position to paint her from the rocks. 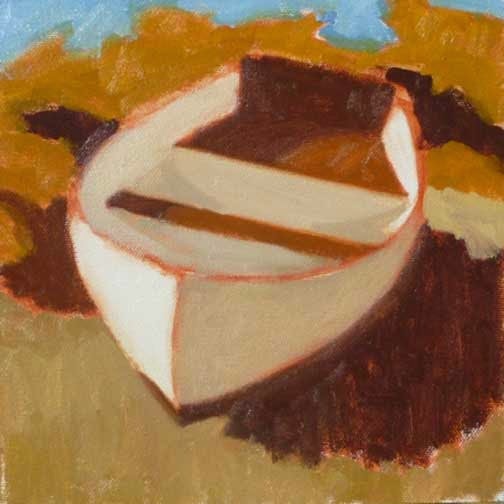 I wanted to use what I learned last week with Anne Blair Brown, so I did a value study in burnt sienna, then a color block in, and finally looked for shapes within the shapes (this last is the hardest part for me). I think I am starting to get it.